In Bangladesh, tobacco control is considered a low priority issue compared to other health-related programs. Tobacco control-related research has historically not been a popular topic within the academic community in Bangladesh. Therefore, there is a dearth of facts and figures needed to design and develop an effective tobacco control program in Bangladesh. The overall objective of the program is to popularize the tobacco control research in Bangladesh and generate local evidence to support effective tobacco control interventions in the country, and thus prevent deaths and diseases from tobacco use. 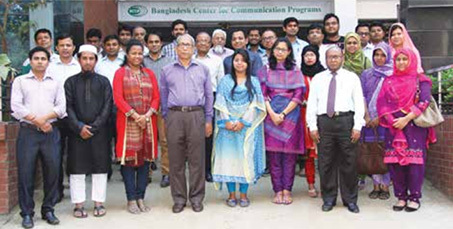 With funding support from the Bloomberg Initiative (BI), the Bangladesh Center for Communication Programs (BCCP) in collaboration with the Johns Hopkins Bloomberg School of Public Health, Maryland, USA and Bangladesh Tobacco Control Research Network continued its efforts in undertaking the Tobacco Control Research Grant Program in Bangladesh. The Tobacco Control Seed Research Grant Program, the first of its kind in Bangladesh, was introduced in 2013. Involving capacity building workshops covering the whole spectrum of the research process, the program has been implemented over the last four years with an emphasis on engaging graduate student researchers. All Bangladeshi postgraduate students and established researchers aspiring to contribute to tobacco control are eligible to apply for the grants. Develop a self-sustaining network as a forum for tobacco control researchers to exchange ideas, share research findings, generate new tobacco control research and utilize their findings. The student should be enrolled in a postgraduate program in Bangladesh. A proof of enrollment must be submitted with the proposal. Applicant should be available in the country throughout the research period. Researchers having a Masters, M.Phil, or PhD. degree and affiliated with any university, institution or organization in Bangladesh can submit a proposal. The applicant must submit a No Objection Letter from the applicant’s respective organization to conduct the research once selected. Freelance researchers based in Bangladesh having a Masters, M.Phil., or PhD can also submit a proposal. The research topic must be within the themes provided below and the priority issues of the Bloomberg Initiative to Reduce Tobacco Use (monitor tobacco industry activities; protect people from tobacco smoke; warn about the dangers of tobacco through mass media campaigns and health warning labels; enforce bans on tobacco advertising, promotion and sponsorship; raise taxes on tobacco). Proposals on generating local evidence that would contribute to developing a new policy or strengthen an existing one in line with the components of World Health Organization’s MPOWER package (http://www.who.int/tobacco/mpower/en/) are recommended. Interventional studies, proposals on quitting tobacco use, sub population based studies and evaluations of in-country tobacco control projects are currently considered to be non-priority issues. The review panel follows a three-step review process. In the first step, preliminary screening is done to see whether proposals follow the proposal submission guideline. The second step involves the technical scoring while in the third step, applicants present their proposals to the review panel. Combining the scores from the technical evaluations and presentations, a merit list is prepared. As of 2016, sixty researchers including both established and graduate student researchers have been awarded seed research grants. Following each grant cycle, the research findings have been disseminated through scientific conferences. Print and electronic media covered the news of the conferences and published special news/articles on the individual research studies. Different organizations working on tobacco control have been utilizing the research findings to design Social and Behavior Change Communication and advocacy programs. Some research studies have been published in national and international journals. The findings of some research studies have also been presented at national and international conferences. The BTCRN website, apart from providing this Network’s activities, works as a one-stop virtual center for tobacco control-related policies, laws, conference proceedings, research articles, and relevant other information and announcements from home and abroad. BTCRNHouse# 08, Road# 03, Block#A, Section# 11, Mirpur, Dhaka-1216, Bangladesh. Subscribe to our email newsletter for news, events and valuable resources. © 2017 BTCRN. All rights reserved.